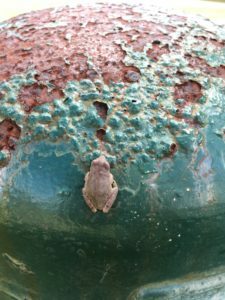 If I hadn’t been in the moment, I’d have missed this cute little frog on a rusty water fountain. He’s a creative nonfiction essay waiting to happen. Despite a sometimes crushingly high level of anxiety that makes me worry about hypothetical future scenarios, I’m generally a person who lives from moment to moment and day to day. I spend as much time as possible outdoors, which both feeds and causes my desire to live in the moment. I’ll dwell on things I dread, like a doctor’s appointment that’s a week away, but I’ll also pay attention to every little detail of the current moment. I’m that person who finds everything while walking and running—tiny plastic snakes (happened last week), late-blooming and nearly microscopic wildflowers, dirt-encrusted pennies—and through a combination of cynicism, realism, and having worked in healthcare, I’m constantly aware of my life’s fragility. This attitude, a combination of intense life plus extreme awareness of death, doesn’t make me the ideal candidate for a job in an industry that largely relies on the future. A book contract on a manuscript that won’t be published for a year or more is antithetical to my existence, but I’ve chosen to adapt because I absolutely love writing. I really do, and not just compared to some of the horrible jobs I’ve worked in the past. One of my upcoming magazine articles is slated for a year from now. I’m securing speaking events for eight or nine months from now. I roll with it and often feel exited that I’ll still be considered relevant in a year, but I’m also constantly left with a head-shaking feeling about the assumption that I’ll be alive at those future times. Planning life so far in advance seems like one hell of a presumptive exercise. I’m currently in the process of trying to get my second creative nonfiction book under contract, and it’s inevitable that some of my goals are time-related. I want to secure a second contract while I’m still in my thirties. I want to see the book in print while I’m still in my thirties and go on tour before two of my friends complete their planned move away from Atlanta. The list isn’t endless, but it’s pretty long, and I have to stop myself and try to reshape things in more of a daily sense so I don’t lose my mind. It’s absolutely possible to work in publishing but still pay attention to everyday existence. It’s not the easiest thing, but it’s doable. My best solution is to try to have micro-victories along the way to the larger goals. Article slated for publication for November of next year? Great. But in the meantime, I have lots of time to update websites, tidy proposals, and publish essays. Speaking engagement eight months away? Motivation to score a few smaller gigs beforehand as practice. My method isn’t flawless, but I try hard to honor the part of myself that needs to appreciate moments while also honoring a business that demands future planning. Planning, while paying attention to the here and now, is often aided by old-school accessories like a calendar and a journal. I can put that far-off literary event on my calendar, make sure not to double-book, but also see in literal black and white how many days are between now and then. I’ve never been a consistent journaler, but even writing a few sentences at the end of each day helps me focus on the good and bad of daily life rather than anticipating something way down the line. Even though I grew up with a computer in my face, nothing beats pen to paper for realism. Realism helps keep me grounded in an industry that constantly requires me to look far ahead. 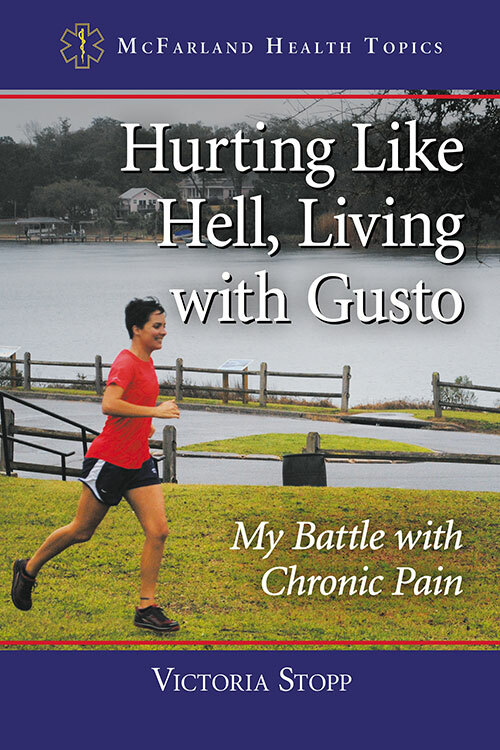 Click here to learn more about my book, Hurting Like Hell, Living with Gusto: My Battle with Chronic Pain. It’s a creative nonfiction book that earned gold in the Florida Authors and Publishers President’s Book Awards contest.